Cancer Is Partly Caused By Random Mutations, Study Finds : Shots - Health News Researchers have long known behavior, environment and genetics play a role in cancer. A study in Science finds luck is also a major factor. 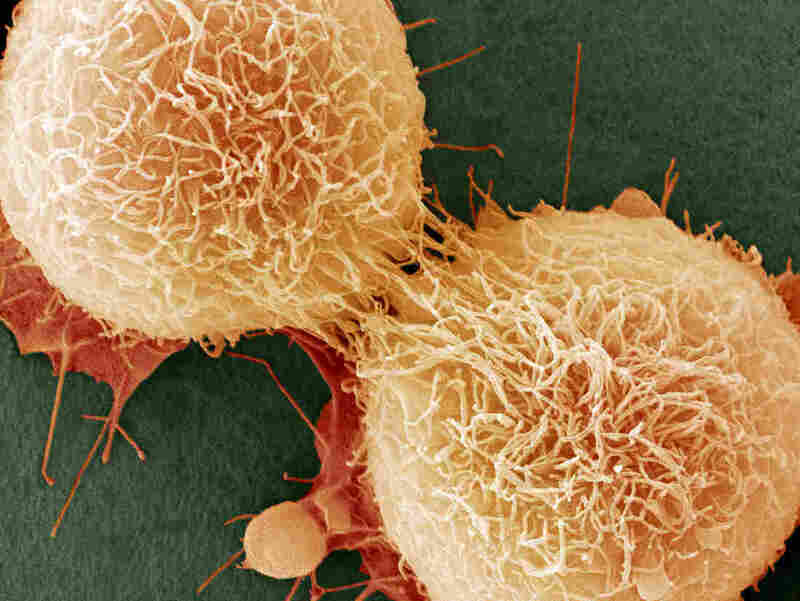 Nearly two-thirds of cancer mutations arise randomly. Nearly two-thirds of cell mutations that cause cancer are caused by random error, a study found. "We all agree that 40 percent of cancers are preventable," he said at a news conference. "The question is, what about the other cancers that aren't known to be preventable?" Of course, people can reduce their risk of preventable cancer by avoiding tobacco, eating well and maintaining a healthy body weight. But the bad news is that most mutations arise naturally. So, what can people do? "Nothing. Right now, nothing," Vogelstein says. But, he's hopeful that if scientists focus on that question, they will have a more encouraging answer someday. Even without an action plan, the question of how much human cancer is caused by bad luck and how much is caused by bad things we do "is super fascinating," says Martin Nowak, a biologist and mathematician at Harvard who wrote a commentary about the study for Science. He says the findings are stirring up the field, and that's a good thing. "It's very unclear to me about whether we have the tools to answer these questions," he says. And, rather than settling the controversy raised by the scientists' previous paper, "I think it will raise an even bigger controversy," Nowak says. One of the new sticking points is that mutations, while necessary for cancer to develop, aren't the whole story. For example, some scientists say the study doesn't fully account for how hormones can influence cancer. Dr. Graham Colditz, an epidemiologist at Washington University in St. Louis isn't convinced that hazards can been neatly sorted into the categories of hereditary, environmental and unavoidable mutations. "How these interplay with each other, I think is potentially more complex," he says. Vogelstein and Tomasetti agree on that point. The causes of cancer are complex. "We're not saying the only thing that determines the seriousness of the cancer, or its aggressiveness, or its likelihood to cause the patient's death, are these mutations," Vogelstein tells Shots. "We're simply saying that they are necessary to get the cancer."